Thanks for the information Tim. What are the disadvantages of using the cheaper XF 105 against the pricier XF 305? Nice write up. How do I know that the cameras (xf305) are truly genlocked. Im trying to use two of them in conjunction with a Black Magic Ultra Studio 4k and I cannot see the second camera. BMD hardware is very sensitive to genlock sync and requires perfect sync before you will see anything other than black on any "3D" dual SDI input. This is a good thing because other muxer boxes (Matrox MC100 & AJA Hi-5) will still mux signals that are not in perfect sync. I haven't personally tested the Ultrastudio 4K yet but I will assume the 3D input modes are still available just as with Ultrastudio 3D. Do your testing with Blackmagic Media Express. When 3D is working you will see both inputs side by side in the preview window. When the camera is locked to an external source I think you should see "EXT-LOCK" on the side panel. You can use the component cable to connect the luminance (green) of one camera to the genlock in of the other. This works in all frame rates except 24p. If you are shooting 24p then you will need an tri-sync signal generator (like the AJA Gen-10) to provide genlock sync to both XF305 cameras. I've got the cameras genlocked using your method with the out component green of the master camera to the genlock in of the slave camera. The slave camera's display does blink on and off for a few seconds, so I'm assuming it's genlocked. I still can't get the 4K to see both cameras. Do I have to set anything in the Genlock Adjust menu setting on the cameras? I've tried different resolution settings too. I'm not shooting in 24p either. I have ordered the Gen10 to see if that helps. 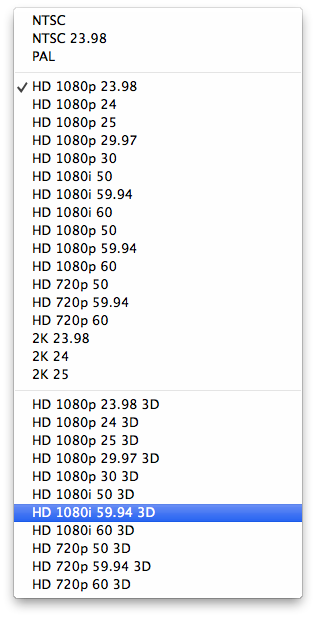 Also, what pull down setting do I need to have the cameras set to? I'm trying to use 1280x720 60p. You won't have to change anything in the genlock settings. Defaults will work fine. 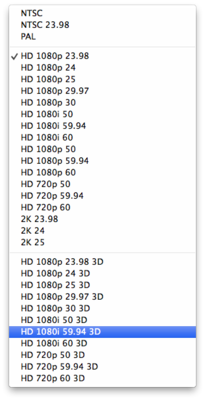 I would recommend working with 1080i59.94 instead of 720p60. It is important that the component output from the "master" camera is also set to 60i (a.k.a. 59.94i) which it is by default. In fact you could use NTSC. Pulldown only matters in 24p. If the Ultrastudio 4K works the same as the Ultrastudio 3D you should see 3D options in the video format menu for the Blackmagic Media Express app once you have connected to the SDI inputs A & B. Select the appropriate one for your input type. See attached frame grab. If it is working properly you will see a left and right image in the "Log & Capture" tab once you close the preferences.